2003 Nissan Xterra. Reliable and dependable, not technologically advanced. The 2003 Nissan Xterra is a safe and affordable vehicle. When taken care of regularly, this vehicle is extremely dependable lasting well past 250, 000 miles. It is very common to find a decent Nissan Xterra used. This vehicle seats five (5) passengers and contains trunk space via hatchback. The back seat cushions come out entirely and fold down creating more room to transport larger items for those big projects. The roof rack on top allows for a secured car top carrier. This feature is nice when traveling with the family because everyone in the car is able to bring what they want and still have room inside the car to be comfortable. When purchasing the 2003 Nissan Xterra, be sure to check what wheel drive it is. Not all of the 2003 Nissan Xterra's are 4 wheel drive and the 2 wheel drive causes occasional sliding in wet and/or icy conditions. During the winter season, the heating unit works wonderfully. However, it has been noticed that the air conditioning unit does not work as efficiently. The good news is that the air conditioning belt is separate from the rest of the belt systems under the hood, so if the air conditioning goes out, it does not affect the rest of the belt systems under the hood. The big windows minimize blind spots making it safer when traveling on the road. With this car, the owner has the option to buy off-roading tires, making this vehicle great to drive on loose gravel and dirt. 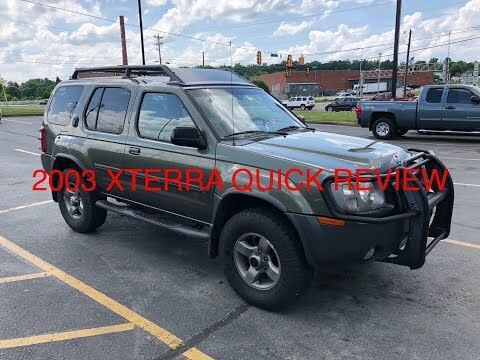 Keeping in mind that the 2003 Nissan Xterra is not the most technological automobile, it is still very reliable and dependable and I would highly recommend owning one. My Nissan Xterra is perfect for me! I really love my Nissan Xterra. It has 4 wheel drive which makes it super easy to drive around in the snow or mountains with. I love that it comes with a safety kit. I went camping, laid the seats down and slept in it super comfortably. I love the size of it and the sporty look. Best car I've had. Runs a little rough sometimes but I feel like it's built to last. It is a bright yellow 2003 Nissan Xterra. The right side of the front bumper is loose and squeaks when I drive and the drive is very bumpy. I also can't see my radio when its nighttime and sometimes the radio doesn't work at all. The gas is fairly good for a engine that has a v6, it costs about thirty-eight dollars to fill and lasts about a week and a half, to two weeks until I need to fill it up again.